Mercury Relays (Mercury Contactors) are all designed and built to meet the most exacting demands of industry. They have won their high place in the electrical field by doing the tough and tricky jobs that ordinary equipment could at best do in an uncertain manner (especially resistive heating). They have proved their ability to stand up under the most adverse conditions of temperature, dust and moisture, in all types of applications. All the care required for the manufacture of high-grade instruments is used in the manufacture of the switches. All switch parts are specially cleaned, and contamination is avoided by use of tweezers, gloves, etc., when making assemblies. Mercury Relays (Mercury Contactors) are hermetically sealed with high quality glass to metal seals. The coils are wound on compact nylon bobbins and molded onto the metal tube to provide minimum power loss. This allows for low coil power required to actuate the contactor. This also enables the units to handle high loads with minimum de-rating due to higher ambient temperatures. Inert gases internally prevent excessive arcing between the mercury and the electrodes which enables the unit to function for millions of cycles with very low contact resistance, and minimum deterioration of the internal parts. Available in all standard coil voltages, in single pole, two pole and three pole arrangements. Other coil voltages available upon request. In multiple pole units each tube is actuated by its own coil. This eliminates pull-in variation between contact tubes, assuring consistent switching. If you are wanting to return mercury relays, please refer to relay return policy and SDS here. The mercury relays (mercury contactors) load terminals are isolated from each other by the glass in the hermetic seal. "The plunger assembly", which includes the ceramic insulator, the magnetic sleeve and related parts, floats on the mercury pool. 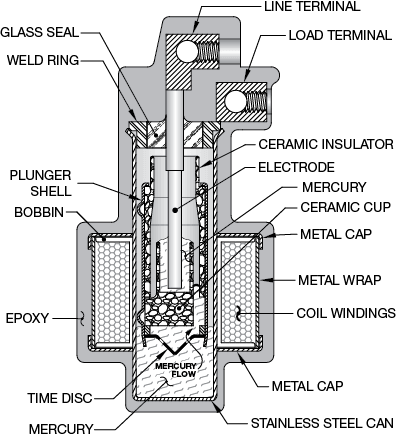 When the coil is powered causing a magnetic field, the plunger assembly is pulled down into the mercury pool which is in turn displaced and moved up to make contact with the electrode, closing the circuit between the top and bottom load terminal, which is connected to the stainless steel can. To make the unit function as a "Hybrid" time delay, we add a solid state circuit to the coil to delay the power to the coil. For constant duty applications, a return spring is used in place of the buffer spring. Time Delay Relays Are available with delays of up to 15 seconds on normally open units, and 4 seconds on normally closed units. The timing limitation depends on the contact action required. A time delay function is accomplished in this unit by sizing a hole in the time disc that will control the rate of the mercury flow. This controls the time it will take from the instant the coil is powered until the mercury pools make contact with each other, closing the circuit between the load terminals. Typical contact ratings 10 AMP @ 120 VAC. Pilot duty rating 720 VA. Common coil voltages are available. Standard load terminals are compression type. Coil terminals use #6 binding head screws. Ratings: Derate over 480 VAC Res. For UV Curing, and Various High Voltage applications. Available in Single Pole, Normally Open, and Normally Closed Units. The coils utilize 6-32 Wire Binding Screws, and the Contacts use Compression type terminals for 4 thru 14 AWG wire. While MDIs contactors handle high inrush, such as lamp loads, very well, mercury contactors are susceptible to damage by short circuit currents, and should be fused to minimize short circuit fault currents. Fast acting UL class RK-1 and class J fuses and semiconductor I²t fuses more effectively protect relays than other fuses. These are low-peak fuses designed to limit short circuit currents. Regardless, when there is a short circuit, relay operations should be closely monitored afterward because of the possibility of concealed damage that could cause the relays to behave inconsistently. Mercury Displacement relays must mount vertically +/- 10 degrees. Control line can be protected with metal oxide varistor (MOV). Use suffix -11. Disconnect power before installing or servicing. Observe all electrical and safety codes and ordinances such as National Electrical Code (NEC) and the Occupational Safety and Health Act (OSHA).